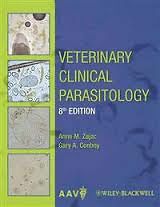 Zajac Anne M., Conboy Gary A.
Veterinary Clinical Parasitology, Eighth Edition, prepared under the auspices of the American Association of Veterinary Parasitologists (AAVP), emphasizes the morphologic identification of both internal and external parasites of domestic animals. Focusing on the tests and information most relevant to daily practice, the book describes accurate, cost-effective techniques for diagnosing parasitic infections in animals. Including clear, easy-to-find information on the distribution, life cycle, and importance of each parasite, Veterinary Clinical Parasitology offers more than 450 images to aid with diagnosis. The Eighth Edition includes a new chapter on immunologic and molecular diagnosis, increased coverage of ticks and new sections on identification of microfilariae and larvae in diagnostic samples. The new edition also features expanded information on quantitative egg counts, detection of anthelmintic resistance and identification of ruminant strongylid larvae. Additional improvements include many new images throughout the book, revised taxonomic information, and a new layout featuring tabs by section to improve user-friendliness. Veterinary Clinical Parasitology is a highly practical benchside reference invaluable to clinicians, technicians, and students.